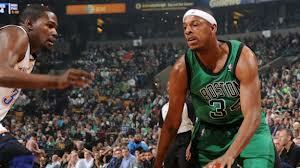 Boston Celtic small forward Paul Pierce plays hard as usual. Boston Celtic small forward Paul Pierce has always been one of those players who plays with passion, commitment and integrity. Pierce is a competitor who hates to lose. Last night against a very hot Oklahoma City Thunder team Pierce got hot and knocked down 27 points, Of those 27, 22 came in the second half. It helped get the Celtics to 7-6 and stopped a 2-game skid, as Boston silenced the Northwest Division-leading Thunder 108-100. Pierce was great from the field, hitting 8 of 16 and he was perfect from the free throw mark, going 7 for 7. But it was downtown where he did major damage, tossing up 6 and sinking 4 (.666). Shooting guard Jason Terry also had a big game with 16 points, including sinking 4 of 6 from the three-point arc. Maybe the Celtics simply know “downtown” Boston better than the out-of-town Thunder but whatever the reason may be Oklahoma City was cold from downtown going 6 of 24 (25%). The Celtics were 9 of 17 (52.9%). Those three-point shots were a major difference in the game. Although Rajon Rondo had just 6 points, he was still a major factor as once again he kept his pursuit of the NBA assist record alive. He had 16 assists against the Thunder, putting him just one game away from tying John Stockton’s mark of 10 or more assists per game for 37 straight games. After that, if Rondo reaches Stockton’s mark tomorrow against the Orlando Magic, he’ll then be in line to go for Magic Johnson’s all-time NBA record of 46 games. This is a gutsy Celtics team. 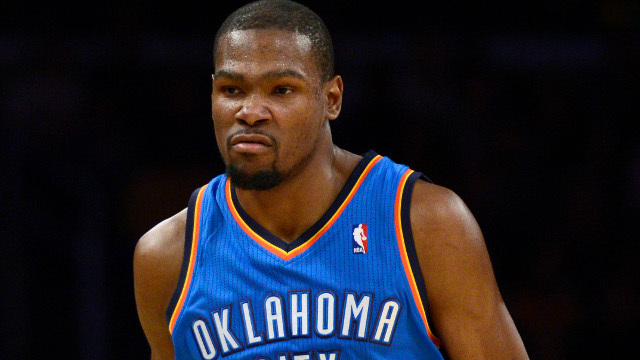 They will not be the top team in the NBA, the Eastern Conference or even the Atlantic Division. But they will be contenders and I think they will be in the mix in the postseason. It’s great to see Rondo coming into his own. Terry is coming through, Garnett is totally reliable and a true athlete and Pierce is…well… Pierce. He’s in it each and every game. He wants to win every game. The bench is solid and the defense is decent. I still have concerns about Boston’s rebounding chops; this is especially true on the offensive boards. I am hoping that shows improvement. The Celtics are fifth in the Atlantic Division while the New York Knicks top the division with an 8-3 record. A win tomorrow against the Magic will be a big step for Boston.